I have failed. It’s ok to fail. Let me say it again moms. IT IS OK TO FAIL! 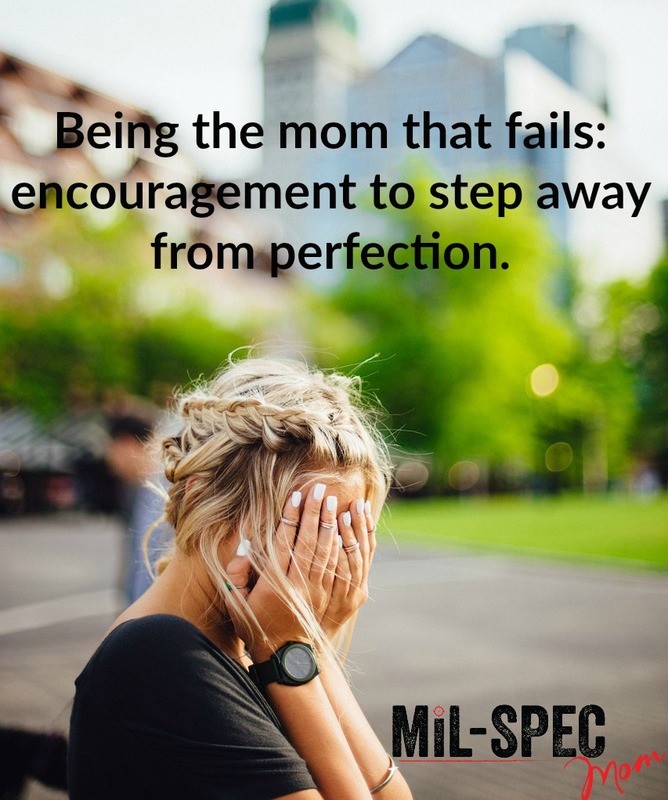 It’s ok being the mom that fails. I’ve had to learn this the hard way the past year. I’ve tried it all. I don’t strive to fail. I strive to be the perfect wife. Strides are taken to be the Proverbs 31 wife. I strive to be the best Nila that I can be. There are times, however when I just strive to make it through the day. Some days I feel sad, angry, happy, and some days I feel a myriad of things that make it challenging to be my best. Other days I am tired. Other days I just “can’t even” to quote high school girls these days. There are some days where I know it’s just not going to get done. And that’s ok. I see all these moms who always have a lovely organic, grass-fed, homemade dinner ready for their families promptly at 6:00 pm every night. Those moms whose kids are never little turds and always dressed in clean jeans that don’t have any holes in the knees. I see these moms who relish playing taxi service, who are always on time with their perfectly highlighted hair (never showing any roots), their freshly done nails, their MK purses, perfectly matched and fitting outfit with heels. All of this just to run their kid to school at 7:45 each morning. I’ve tried to be that mom. I’ve tried to be lots of things that even remotely resemble this mom. Even getting up at 5 am to get a workout and do something with my hair other than the “mom-bun”. I think I’ve pinned every crockpot freezer meal on all of Pinterest right now. Do I make them often? Hardly ever. My 6-year-old doesn’t make it to school on time every day, and he definitely wears jeans with holes in them. Thank the Lord for school uniforms, I must say. A little secret from one mom to another; there are times that I drop Ronan off at school in my jammies. Some days I don’t have time to brush my teeth or put on a bra. Thank God for school drop off where you don’t have to get out of your car 😉 My 6-month-old often has food on his shirt, or up in his nose. Is it going to hurt him? Absolutely not. He’s going to scream more when I try to wipe his face off, in fact! Somedays I just don’t have the fight in me. That hill isn’t the one to die on. So I’ve failed at being the perfect, Stepford-Pinterest wife. I’ve failed at having my nails done; because seriously “ain’t nobody got time fo dat!”. I’ve failed at always having my hair perfectly highlighted. I’m lucky to get my hair brushed some mornings. I’ve failed at hole-less jeans and being to school on time. And I’ve failed on the whole organic-grass-fed thing by 6 deal too. I’ve failed at being perfect. But you know what? I’m fine with that, and you need to be fine with that also. My point here is this. Family first, if it works for YOUR family then do it! My family does just fine when I spent my morning in my PJ’s. They do just fine on the occasional McDonalds meal or Chinese take-out. My family does just fine, great even, when I wing it for dinner and when I plan two weeks of meals in advance. I do what works for the family. They’re better for it! So I fail at being the perfect, Pinterest, Stepford wife and mom. I’m glad that I fail at being that mom. I’m much happier being me. My family is much happier with me being me. Embrace yourself and the role that God has placed you in. He made each of us unique and each of our unique roles requires us to be the real us. Be the real you. Embrace the real you. The role that the Lord has for you. Embrace the jammies! Let the rest go, you cant do it all.